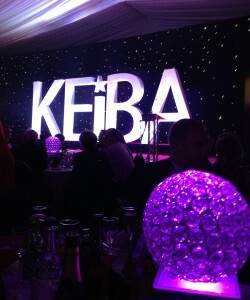 Last night we were privileged to attend the glitzy gala for the Kent Excellence in Business Awards (KEiBA), which was held at the Kent Event Centre in Detling. The evening was hosted by Paul Hendy whose production company are responsible for pantomimes staged in both Canterbury and Chatham. He’s also a TV presenter and author. The venue was stunning inside. The organisers had done a fantastic job with creative use of lighting and dry ice; we could have been transported from the Kent Showground to an uber-trendy hotel in London. We shared our table with representatives from Southeastern, who sponsored the Best Leisure and Tourism Category, and Visit Kent, who had helped with the judging of that category. The awards ceremony itself was split into two parts, with dinner served in between. The stage was ‘T’ shaped with a catwalk jutting out into the room, award winners were invited to strut their way up the catwalk to the stage to collect their awards while lights danced around them. It was good fun. Unfortunately, we didn’t get the chance to do the walk ourselves, however just to be finalists for three prestigious KEiBAs is a great achievement. Dinner was wonderful; all the food was Kentish and tasted delicious. We truly were celebrating the best the county can offer, not just in business. Even, the wine we ordered was from Chapel Down winery in Tenterden. The table magician was amazing; I’ll never know how he did those tricks! We had a brilliant night and would like to thank the organisers, the KM Group, KCC and Pillory Barn, for all their hard work. 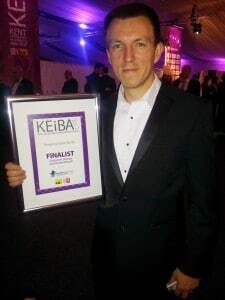 We would also like to take this opportunity to congratulate all the winners, including our clients, and friends, Aquaread who took home the trophy for Best Science and/or Technology Business, a full list can be found on the KEiBA website. The special Outstanding Contribution to the Business Community of Kent award was given to retiring KM Group Business Editor Trevor Sturgess.